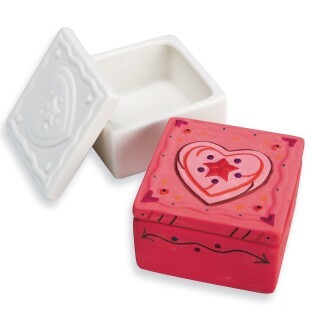 A sweet box for special treasures! A sweet box for special treasures! Features embossed heart design on lid. We recommend decorating with acrylic paint or permanent markers. Decorating supplies sold separately. Pack of 12. Box measures approximately 3-1/4” square x 2”H. We supplied the bisque birdhouses trinket boxes and mason jar vases at our church's annual craft workshop. This activity was popular. We provided acrylic paints and paintbrushes minimal supervision was needed. This is a great activity without a lot of preparation. Just give out the supplies and let them paint! We usually use a variety of the SSWW bisque items every year. They are good quality and value and the crafters enjoy them.